Shared with 2%! ^^ Yeah!! Well, I'd agree with this...my hair is sorta brown/blond in real life, so not much of a change here. I agree with it. You are Brown!! You're laid-back, calm, and careing!! You like to relax. And you always have good advice for people! You love to be with your friends too! You can be very stubborn at times also. Evem though people may think your calm and not much of a fighter well you also have a tough part in your personality! And your not afraid to stand up for yourself and other friends. You are LAZY ANGEL! hey well all i can say is... good night and have fun you couch potato! all you do is... well nothing! ya know for an angel you sure are... lazy! Aww...cute. ^^ I shared this with 14%. I think the result's pretty accurate. Shared with 33%...wow, that's more than usual. I suppose there's lots of depressed ppl out there. ^^; I somewhat agree with this result. You are depressed. You seem to never want to trust anyone and always have something to be sad about. The past is constantly haunting you and you can't seem to get away. What's Your Angel Seeking For? . 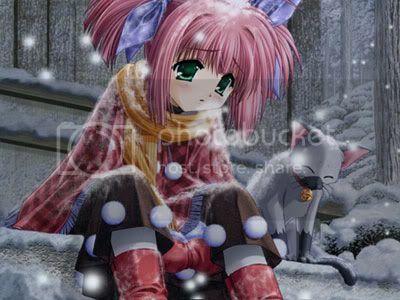 :BEAUTIFUL Anime Pics AND Music!:. Your angel seeks for the truth. Your angel is part of you. Thus, you are the kind of person who values honesty more than most things in this world. You are strong-willed, and a bit stubborn at times. In love, you seek for someone who will understand you, and never cheat on you. This would probably hurt you a lot, as it would to a lot of people. But it would probably hurt you the most. You are brutally honest, and you voice your opinions a lot. Go you! Shared with 7%! ^^ Yeah, I am pretty relaxed most of the time...I've even been told that, too. You have this constant feeling inside that says that everything will be alright. Calm cool, you invented the Chill Pill! (WHAT?! )Whenever there's a problem you don't spaz out, that's why people come to you for advice because you're really reliable. Not many people have the aura of calmness that follows wherever you go. Whenever people are around you, they loosen up, relax, just by being near you! Your motto is 'Sit back and relax'. Stay the way you are, because you rarely get stressed out! Your Power Is: Understanding you are very sad because you have been hurt so many times in the past. Since you have been through os mutch, you understand when other people go through similar situations. this makes you a great friend to have when someone needs support. Desires: you wish you had been more brave in the past so things wouldn't have turned out so bad. you'd fall in love with a guy: who is sweet and will be your shoulder to cry on. your ideal job is: a personal adviser. Shared with 17%. Umm...well...I guess I wouldn't mind a first kiss. ^^; THere's a first time for everything! Shared with 24%. ^^ I don't know who this Elias person is...but the swimsuit is nice. h: you are falling for elias, you love that he is crazy fun, you love that he is also a shy boy, that he is just himself! oh yeah well this is your bathing suit that you chosed go to my album, for more anime pics!!! Well, I like the pic...it's too bad I'm just "normal". Shared this result with 13% of the people that took it. ^^; That's more than usual! Who's ur inner pretty anime girl?